Friday Febuary 5th 1876. Weather much more moderate today. I walked to school and back again today. The folks we were expecting from Iowa City did not come. Uncle Albert went to Mason City today. Ira and Uncle went down town after supper. They brought me a letter from Charlie. We young people played cards all the evening. 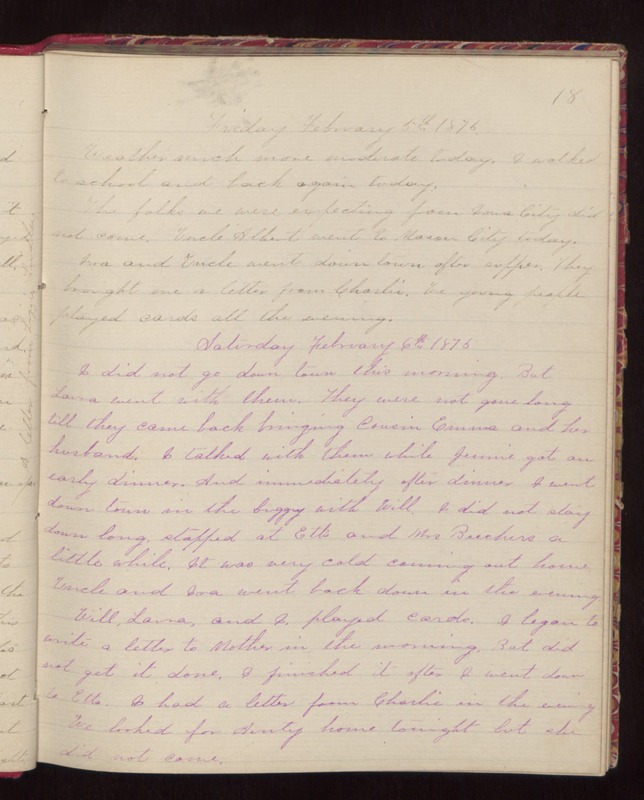 Saturday February 6th 1876 I did not go down town this morning. But Laura went with them. They were not gone long till they came back bringing Cousin Emma and her husband. I talked with them while Jennie got an early dinner. And immediately after dinner I went down town in the buggy with Will. I did not stay down long, stopped at Etts and Mrs Beechers a little while. It was very cold coming out home. Uncle and Ira went back down in the evening. Will, Laura, and I played cards. I began to write a letter to Mother in the morning. But did not get it done. I finished it after I went down to Etts. I had a letter from Charlie in the evening We looked for Aunty home tonight but she did not come.